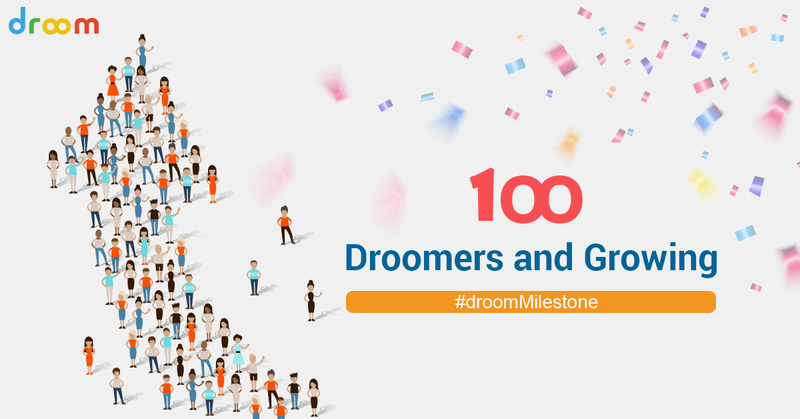 An incredible journey of months of hard work has brought us here -100 Droomers and growing. It all started with a dream of making it big and today, we stand together as a company of 100 Droomers – the blood and sweat of everyone has made us what we are today —India’s most disruptive and innovative start up. This milestone has been reached after an amazing journey—hundreds of brainstorming sessions, loads of sleepless nights, tens of thousands of trying-our-level-bests, and millions of yes-we-made-its! Today, on this eventful day, we are proud of the wonderful culture we have been able to develop, the great solutions we have been able to provide and the customer problems that we are solving and will continue to solve. Our passion and our energy is what drives us, but most of all, it is the employees who make for our biggest asset. We started working on our dream in November 2014, made our first transaction in January 2015, and now we stand at thousands of transactions and happy customers – a milestone in itself. It has all been possible due to the dedicated efforts of our team members and the tireless guidance that our leadership has been able to provide. Today we have nearly 7k+ Vehicles Listed, 51k+ Daily Visitors and 11k+ Sellers—all of which depict a lot of hard work and dedication, something we Droomers are very passionate about. In these last 7 months, we have revamped our app—launched numerous sprints to make the app experience more refined and enjoyable, we have made a lot of changes on our website, to give the best user experience possible and we have loads of plans up our sleeves right now—all poised to make Droom bigger and better. We have come up with amazing designs and looks to give a lucid feel to our content and have always encouraged constructive criticism -one of our primary pillars of success. With a dedicated marketing team and a passionate business development team, as well as seller and buyer support, operations, and all other functional areas – we are an end-to-end managed online marketplace. Our awesome team owes a lot to our Human Resources and our senior management team – the key driver of developing and maintaining the awesome culture that is the true key to employee retention – the basis of 100 Droomers celebrating the event today. We have come miles, miles remain to go. Follow us across our many social channels and become a part of the wonderful team that is poised for greater heights and success. As always, we are fullly committed to providing the best possible experience for buying and selling all things automobile – thank you for being a part of our journey, and keep watching this space for more! One of the best blogs here!